Founded in 1998, Nexyn Corporation has set out to supply innovative products to the microwave community. We are committed to providing technically superior products at reasonable prices with the highest regard to customer service and quality. Nexyn's PLDROs design not only excels in phase noise (see our links below), they also exhibit low spurious and excellent immunity to microphonics. Our products are designed to operate in outdoor environment with high reliability. Guaranteed performance and on time delivery make Nexyn's Phased Locked DROs the smart choice. Nexyn Corporation can provide the necessary expertise, experience, and fast turnaround to meet your special requirements. Now delivering PLDRO's from 3 to 23 GHz and PLO's from 300 MHz to 3GHz. 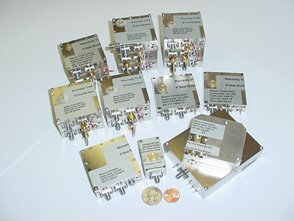 Crystal References and Phase Locked References from 50 to 400MHz. Now also delivering Frequency Synthesizers! Superior performance and on-time delivery make Nexyn's products the smartest choice. Innovatively designed PLDRO's,PLXO's,PLCRO's,FRDRO's, and synthesizers etc..